1 coin=1 JPY. Granted coins are calculated based on the JPY price (excluding tax) after coupon deduction. * Amount of granted coins may change when purchasing multiple items. Please confirm the settlement page for the determined value. * Coin-back rate for membership rank is determined based on your rank when you have proceeded to the settlement screen. The value may change from what is shown on the store page now. * For some coin-back campaigns, you will not be eligible for a coin-back when using coupons. * Please note that payment will be completed with 1-click by clicking this button. * This item is an eBook (digital book), not a printed book. * This item is an eBook (digital content), not a printed book. * Release date and time of eBooks on BOOK☆WALKER are based on PT (Pacific Time). 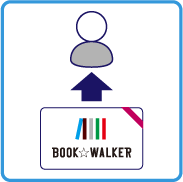 * When using the BOOK☆WALKER app to read the eBook, please check if your your iOS or Android device supports the app before purchasing, by purchasing a free eBook. * If this product is part of a campaign on BOOK☆WALKER, its content and offering period may change without prior notice. The US $ price is approximate amount. It will vary, depending of the day-to-day exchange rate. You will be charged with 8% tax when purchased from Japan. Receive a redemption code to send to a recipient to through e-mails, SNS, etc. *Boosted coins (for storewide coin-back campaigns) will not be granted when buying as a gift. *You may not use coupons or select multiple payment methods when buying as a gift. *This eBook can be purchased as a gift only one at a time. *This eBook can be purchased as a gift up to 10 times per year. *Gift codes are valid for one year from its purchase, and can be only used once. *Due to characteristics of our products, we do not accept change/refund for the gift codes. Page count may vary, depending on the font and image settings on your device. This book is not available for purchase in these regions due to licensing restrictions.